This post was sponsored by the California Strawberry Commission. All opinions are my own. Though most of the farmland that existed in the heart of Silicon Valley is long gone, replaced by suburban sprawl, in under an hour I can be standing amidst acres of fertile fields. And that’s exactly where I stood on April 13, thanks to the California Strawberry Commission. 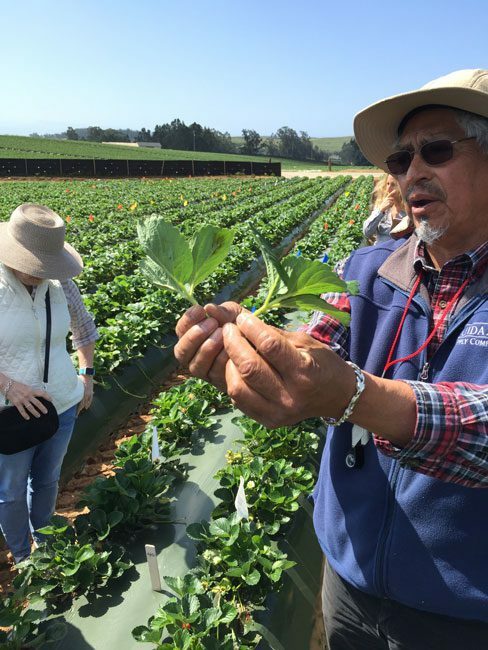 They invited a group of Bay Area bloggers to visit Miguel Ramos’ Watsonville strawberry farm and then dine on a 3-course strawberry-studded meal at Watsonville’s Ella’s at the Airport restaurant. 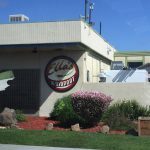 We met at the Watsonville Airport and after a lovely morning snack and chance to meet fellow bloggers, we headed over to Ramos Farms for a tour. The bus parked right in the field, we stepped out, and were greeted by Miguel Ramos, the owner of the 41 acres. 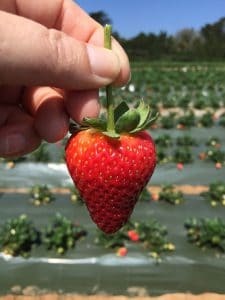 He shared a quick overview of his background and a bit more about his passion for farming strawberries and then up into the field we went to pick, taste, and learn more about how these beauties grow. Miguel has a degree from Cal Poly San Luis Obispo in agronomy. 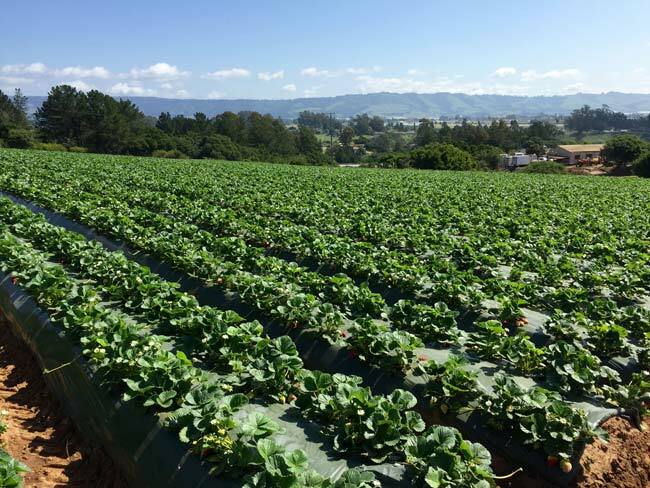 The California Strawberry Commission describes strawberries as the “crop of opportunity.” In fact, 90% of U.S. strawberries are grown year-round in California by 400 diverse family farmers, many on multi-generation farms. Miguel started with just 1 acre and now has 41. Before he started farming, he was an agronomist who trained field workers about pesticides and fertilizers. 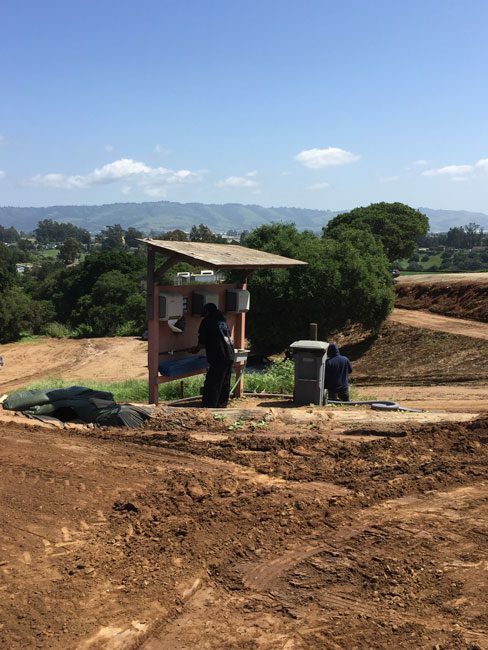 He started to explore what types of crops can sustain families economically and decided to start a strawberry farm. 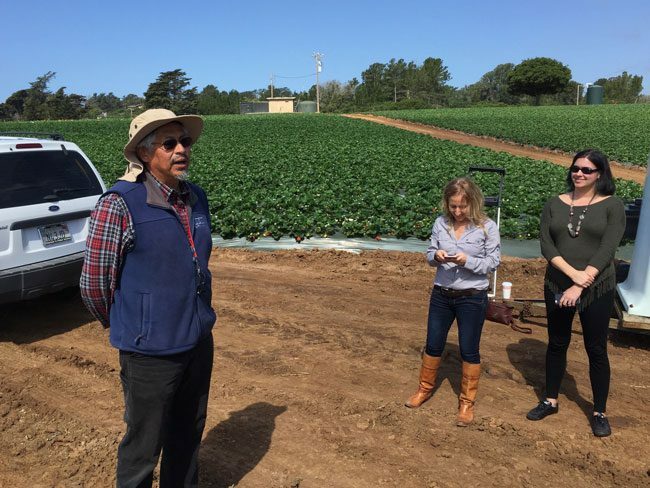 Miguel grows three main varieties – Monterey, Cabrillo, and Albion. 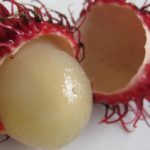 His personal favorite variety for eating unadorned is the Albion variety. Unfortunately, they yield less per acre so he grows more Cabrillo and Monterey. But having tasted the other varieties straight off of the vine, I can assure you the Cabrillo and Monterey do not disappoint. The Albion has a slightly bigger flavor when you bite it, but the others are a very close second indeed. Here Miguel is showing us how to tell the difference between varieties by the leaves – see how one curves up and one curves down? The one that is cupped up is Cabrillo. Miguel also talked to us about his raised bed farming and how the fumigants and pesticides are administered, how strict the rules are that he must follow, and how clean he keeps his fields as well as the very strict hygiene regimen each worker is taught and uses daily. 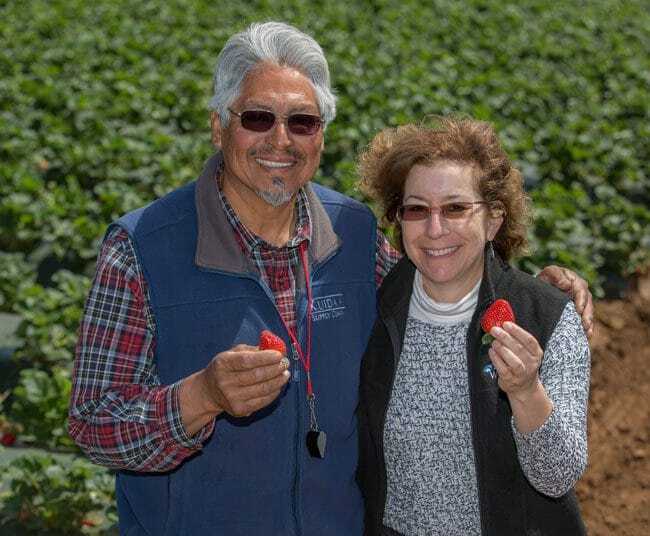 Miguel and the Strawberry Commission shared an interesting perspective with us: farmers live and work in the communities where they farm – so protecting the health of the people, the land and environment is their top priority. Here’s a great resource for science-based information about the safety of organic & conventional produce: Safe Fruits and Veggies. Based on reading many sources of information, I buy both organic and conventional strawberries because I believe that eating clean fresh produce of any kind is always a better food choice than consuming processed foods. The antioxidant, anthocyanin, which provides a strawberry’s deep red coloring and has been suggested to improve memory and brain function. It is also thought that this antioxidant increases the dopamine in our body which is the hormone that makes us happy. Strawberries also contain potassium which is thought to help control blood pressure. Put all this together and the American Diabetes Association considers strawberries to be one of the ten superfoods perfect for a well-balanced diabetic-safe meal. What’s even better than all the nutrition facts? 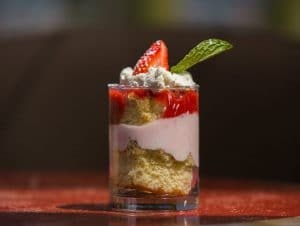 Just how well strawberries complement every part of your meal from appetizer to dessert. We were treated to a lovely lunch at Ella’s at the Airport. 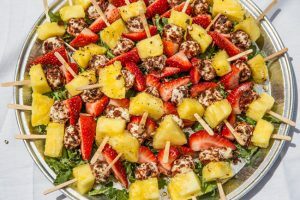 Appetizers included these cute skewers with pineapple, strawberries and a feta/goat cheese ball rolled in crispy prosciutto. Very refreshing with an unexpected savory punch from the cheese ball. Appetizers also included this gluten free pizza (crust was terrific!) 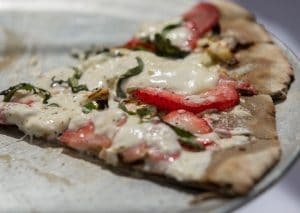 with fennel, strawberries, burrata cheese (yum!) and basil. What a mind-blowing combination. This is on my list to make for my first summer gathering. 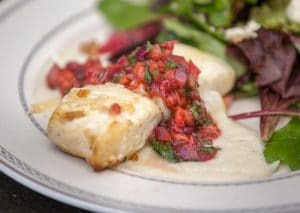 For the main course, we had a choice of seared halibut or pork tenderloin served on a bed of cauliflower puree and topped with a strawberry salsa. On the side, light and refreshing greens with a champagne strawberry vinaigrette. And dessert was a stacked tres leches cake layered with strawberry and regular whipped cream. Fun to look at and even better to eat. 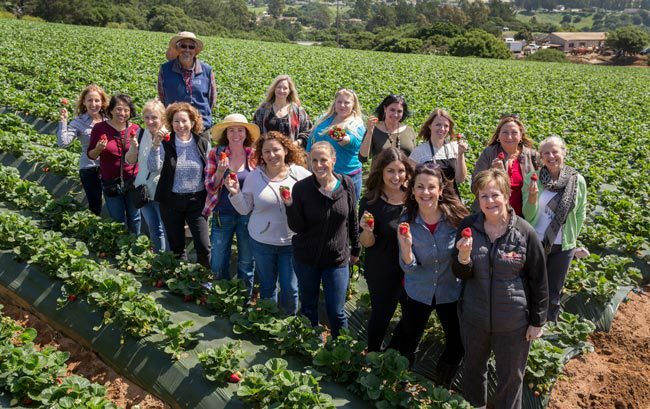 To finish our experience, a blogger who is also a registered dietician, Sarah Koscyk, shared nutrition information with us about the superfood strawberry and we each went home with a crate of fresh-from-the-field berries. That night, inspired by my visit to the strawberry farm, I made a strawberry salad with pomegranate vinaigrette. 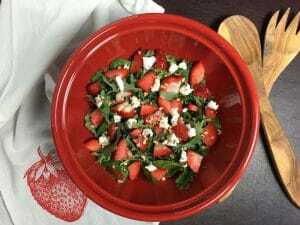 The vinaigrette recipe is already on my blog, the strawberry salad recipe is coming soon! It included spinach, baby kale, toasted hazelnuts, lemon goat cheese, and strawberries topped with a pomegranate molasses vinaigrette. 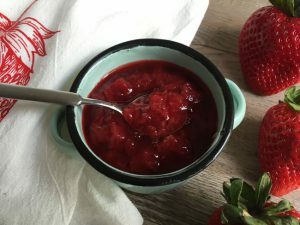 I also made my favorite strawberry jam to date infused with orange and thyme. 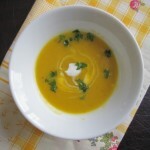 Recipe for that coming soon as well! I can’t wait for my next opportunity to be out standing in the strawberry fields. Until then, I’ll be looking for fresh strawberries at my weekend farmers’ market and local groceries. I was compensated for this post by the California Strawberry Commission. All opinions are my own. Some photos supplied by the California Strawberry Commission and Robert Durell Photography. 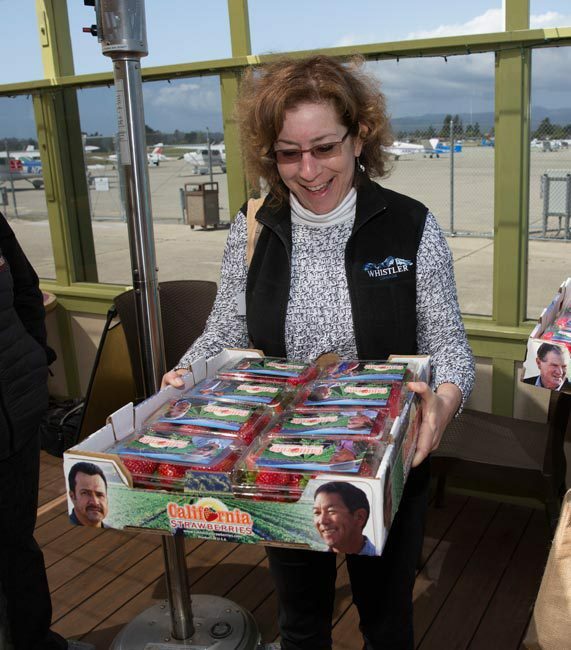 The California Strawberry Commission is a state government agency located in Northern California charged with conducting research to support California’s strawberry industry. With an emphasis on sustainable farming practices, the commission works with strategic partners focusing on production and nutrition research, food safety training and education, marketing and communications, trade relations and public policy. This is literally so cute! I am so jealous of your experience. I bet you felt so relaxed and rewarded afterwards. Thanks Amelia – it was a great day of learning and enjoying the outdoors and great food together. I will check out your blog! Thanks for stopping by! What a fabulous experience! That halibut sounds divine. You are so lucky to live in such close proximity to year-round strawberries. We have such a small window for local strawberries on the east coast. Hi Marci – thanks for stopping by. Yes, we are lucky to be so close to so much fresh produce but the Jersey Shore has its own advantages … the ocean and The Boss! Hope you have a profuse if short season of berries. I remember picking blueberries on Mt. Greylock in Western MA when I was a kid. Oh the smell of any fresh berry is so fantastic! 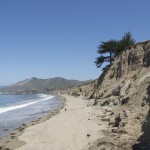 What a wonderful California story! So much #BerryLuscious! Yup – so so California and I loved every minute of it. Hope you are as excited about summer fruit as I am! So looking forward to meeting you this summer Deb!